People are living their lives online, using multiple devices throughout the day to shop, communicate and stay entertained. This constant connectivity means customers are engaging with your business in new ways after seeing your online ad -- they might call your business, download your app or go to your store. Last year, we introduced Estimated Total Conversions (ETC) to give you a more complete picture of how AdWords drives these new conversion types. Since then, we’ve been steadily improving ETC to measure phone calls, in-store purchases and cross device conversions. With the holiday season upon us, it’s clear that the majority of sales for many industries still happen in person - in fact, roughly 95% of retail sales take place in physical stores.1 And online activities are influencing offline transactions more than ever, bringing together the digital and physical worlds. Thirty-two percent of consumers say that location-based search ads have led them to visit a store or make a purchase,2 so it's more important than ever for businesses to understand the impact that search ads have in driving visits to your physical locations, whether that’s a store, hotel, auto dealership or restaurant. In the coming weeks, we’ll be rolling out store visit measurement to eligible advertisers in the U.S. as the latest enhancement to ETC. Learn more. Constant connectivity brings with it an epic shift in the way businesses build experiences for their customers. Consumers are demanding more touchpoints with businesses -- more than 70% of consumers who have used ad features such as directions or the call button say it's important to have location information in ads,3 74% of shoppers want to see how much inventory there is for a product at a nearby store.4 Getting better insight into these new, complex purchase paths can can help you optimize your online marketing programs, design better experiences for your customers and allocate budget more effectively. Store visit measurement is key to unlocking these insights. Here are a few ways that businesses are seeing value so far. PetSmart, the nation's largest specialty retailer of pet supplies, uses store visits data to improve its customer shopping experience -- today, this often starts with people researching online and then visiting a store. Based on the insight that 10-18% of clicks on search ads lead to a store visit, PetSmart is now investing more in ads that reach customers across screens. 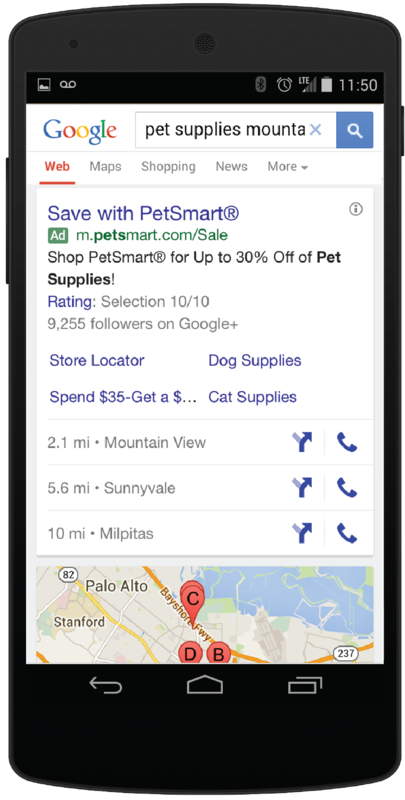 For example, PetSmart has increased use of location extensions in their ads to show maps and directions to help people find nearby stores when they are searching for products like puppy treats or aquariums. Office Depot, Inc., formed as part of the merger of Office Depot and OfficeMax, is a leading global provider of products, services and solutions for every workplace -- whether your workplace is an office, home, school or car. The company uses insights from store visits data to understand which products, such as laptops, printers or backpacks, are driving people to visit one of its 2,000 Office Depot and OfficeMax retail locations. 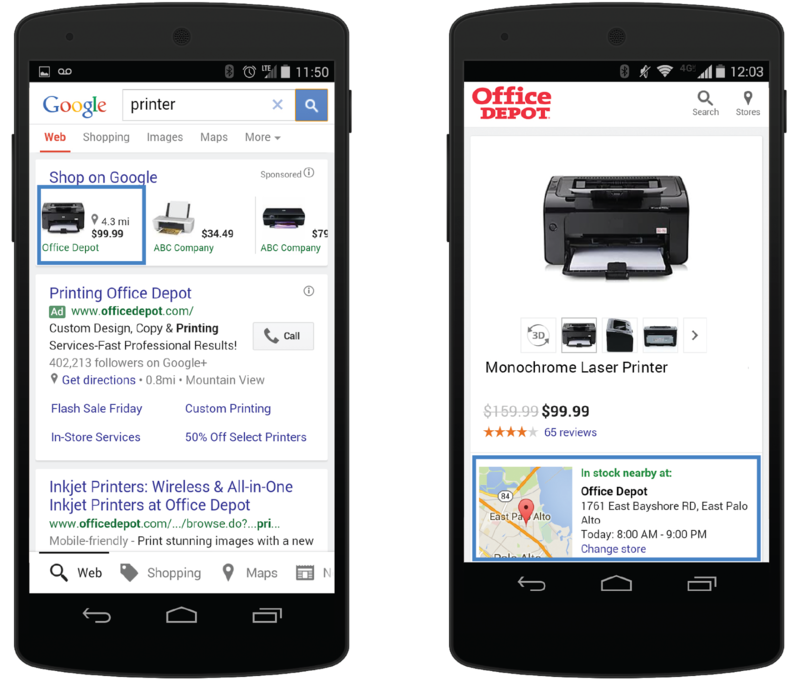 These insights help Office Depot, Inc., decide which products to include in its local inventory ads. These ads show whether or not a product is available in a nearby store and where the nearest store is located. This makes it simple for customers to discover what products are in stock as they’re shopping and researching online. Christine Buscarino, VP of E-Commerce Marketing at Office Depot, Inc., says her team is now able to provide "contextually relevant information, where and when customers need it." This feature has been carefully designed to keep data private and secure. We never provide anyone’s actual location to advertisers. Instead, store visits are estimates based on aggregated, anonymized data from a sample set of users that have turned on Location History. This data is then extrapolated to represent the broader population. If you’re interested in learning more about how you can start using store visits in ETC, contact your AdWords account representative for more information.